Submitting a group disability claim to CIGNA is not as simple as logging into the company's MYCIGNA portal and answering some questions. It's great that CIGNA has a mobile app and a claimant portal, but we caution any disability policy owner to take the application process carefully. CIGNA asks for a Disclosure Authorization and that is easy to obtain also. Just download it, sign it and send it in. But before you do - look closely at the document. By signing it, you are authorizing CIGNA and the companies it hires to review everything about you, from your tax returns to medical records to your financial, earnings and employment history. The form is an exercise in frustration. You are told you are not required to complete the form, but without it CIGNA and any of its third-party companies will not be able to evaluate or administer your claim and so will deny you any benefits, coverage or services. The attorneys at Frankel & Newfield have successfully represented many CIGNA disability insurance policyholders in their fight to obtain or hold onto their short term and long term disability insurance benefits. We work with clients on CIGNA short term disability claims, as well as long term disability insurance claims. We can help CIGNA claimants at various stages of their claim, to help ensure that they are treated fairly and get the short term or long term disability insurance benefits that they deserve. Claim Filing and Monitoring - we help claimants with their initial claim processing, for both short term disability insurance and long term disability insurance claims. By being involved at this early stage of the disability claim process, we can help to ensure that our client's doctors are able to articulate the functional impairments and deficits faced by our clients, to support the claim. We also address any requests for physical or psychological examinations during the claim process, or a request for a Functional Capacity Evaluation. ERISA appeals of denied or terminated claims - we help claimants whose claims have been denied or terminated and are required to undertake an ERISA appeal, before they have the ability to pursue litigation against CIGNA. Our appeal formula for success in overturning a denied or terminated long term disability insurance claim addresses a myriad of issues including medical, vocational, factual and legal. We create a robust appeal that has a dual audience - first is CIGNA, trying to get them to overturn their claim determination. The second is the Federal Judge who may ultimately have to decide your claim if CIGNA does not change their mind. ERISA litigation - we help claimants pursue their rights against CIGNA in Federal Court. We have successfully litigated against CIGNA on scores of occasions, and have an intimate knowledge of how CIGNA's claim handling works, and its strategies in litigation. Leveraging our experience in litigation leads to the most advantageous results for our clients. CIGNA disability claims disputes led to a $77 million settlement in 2013 following investigations by insurance commissioners from Connecticut, California, Massachusetts, Pennsylvania and Maine regarding improper denials of long-term disability claims and wrongfully terminated benefit payments. The settlement also required Cigna to improve their claims handling processes and establish a program to review long term disability claims that had been improperly denied or terminated. 8. Failing to clarify a claimant's restrictions and limitations with the attending physician who was supporting disability. 4. Providing full and complete documentation to its various vocational and medical resources. Any CIGNA claim may be subjected to many of the above-noted to many of the above-noted deficient claim handling approaches, which have already been determined to be problematic. All Long Term Disability insurance claimants on claim with CIGNA should carefully consider whether CIGNA is upholding its obligations under the settlement. 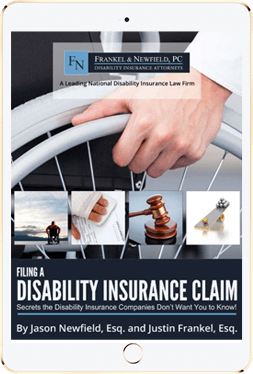 Regardless of when your long term disability insurance benefits were denied or terminated, you need the skilled guidance of an experienced disability insurance attorney that has represented Cigna claimants. Call our office today for a free consultation at 877-LTD-CLAIM (877-583-2524). Frankel & Newfield represents clients nationwide. The bulk of CIGNA’s disability coverage is provided to large and small companies, rather than individual policies. Most these are governed by ERISA. The policies often offer a limited period of “own occupation” coverage that often changes to a less rigorous “any occupation” definition after a 24 month period typically.